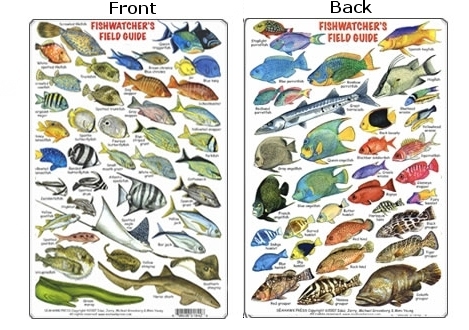 78 species of the most beautiful and commonly seen fishes of the Tropical Atlantic, arranged by family. Covers Florida, Bermuda, the Bahamas, and the Caribbean. 6" X 9.5â€� and printed on a waterproof plastic card similar to a credit card with a hole near the top for a lanyard. Great to have while fishing, boating, diving, and snorkeling.